There is something else besides impatience or the misunderstood economy of time and money; also something other than the archeological and passéiste in this preference for pastiche. Why this fear of anything that is living? Why this tendency not to consider as serious anything that is up-to-date? M. Cingria was right to see in this the working out of a spirit of death and ennui. "The pious," he says, "are accustomed to an art of phantoms, and every effort to introduce a bit of life into the churches seems to them, in contrast, to be immoral, profane and pagan. Poor Life, daughter of God, whom the Demon has chased from the churches in order to put in her place the fear of life!" One wants an art comme il faut in our churches. A petty tradition has developed in such matters, in which hieratism and academism combine to give birth to ennui. No matter what textbook composition, so long as it is solemn and cold, can become a page of sacred art. The academic artists who share the same prejudices, the same fear of life, propose moderate, soothing solutions. That is all correct and respects the formulas. In windows, in images, mural decorations, even, I say, in ornamentation, sad imitations of Ingres and Flandrin which conserve only the coldness of their models continue to proliferate, without ever touching anyone's heart. Those miserable commonplaces are so many masks to disguise a poverty of thought and absence of emotion. They are accepted out of habit, out of indifference, and, in the end, certain feeble platitudes, false gestures, draperies that are boring beyond belief become, like fake Gothic, inseparable from the idea of piety. It is said to be well-designed. Another perversity. Instead of approaching a work of art in a spirit of humble sympathy, one comes before it with the mentality of a drawing-master. Do not say, as I heard only recently at the Degas exhibition - Degas, that prodigious draftsman: "Now that is an arm which is too short or too long, an ill-proportioned leg." That sort of criticism, which requires no great level of understanding, has not been spared Ingres himself, or Delacroix. Fra Angelico did not know how to draw, either, and - just between ourselves - one would have much to say about the drawing of Raphael, and even that of M. Luc Olivier Merson. (20) It is time to recall what Ingres said: "there is no such thing as exact or inexact drawing, but only what is beautiful or ugly." (20) Luc-Olivier Merson, 1846-1920, French academic painter and illustrator also known for his postage stamp and currency designs. Thus for churches with limited resources, we have industrially produced religious objects, tinselly and flavourless. For more wealthy churches, congealed, boring, academic and faux-traditional art. The only resource which such art still possesses, other than the faded remembrance of classic works, is a certain sentimental feeling. It is all at the same time formulaic, romantic and melodramatic. It bestows a silly appearance on sacred persons, hair well oiled, eyes turned upwards, heart-shaped mouths. In this region of honeyed, languorous things, one may find the reflection of all the worst mediocrities of the Italian decadence, as the Christ of Guido Reni, (21) and at the same time the sort of milky sentimentality which we find in certain postcards, or certain wax figures that we see in hairdressers' windows. Such images dishonour our religious iconography. It is maddening to see in representations of God’s Son and the Saints the same blandness which in profane subjects serves to arouse the most vulgar sensuality. 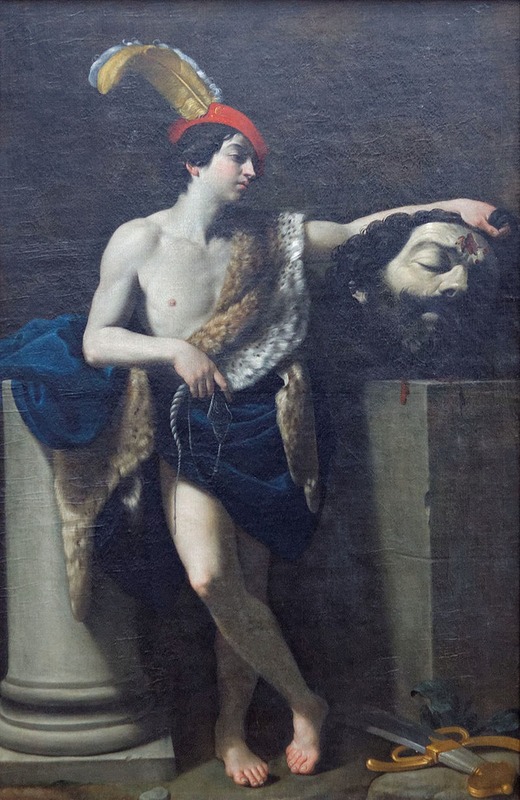 (21) Guido Reni, 1575-1642, hugely influential Bolognese artist specialising in religious and mythological subjects, notably a David with the head of Goliath which may well have impressed Odilon Redon. Have I overstated this picture of our decadence? I don’t believe so. But following this negative critique, I must indicate the direction Christian art is taking and which it must take.